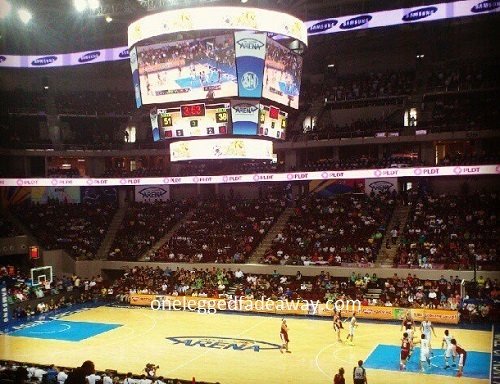 A UAAP men’s basketball game held at the SM Mall of Asia Arena, the venue for the upcoming 2013 preseason game between the Rockets and the Pacers. October 10, 2013 is going to be a date marked by practically every NBA fan in the Philippines. After all, that’s when the Houston Rockets and the Indiana Pacers are scheduled to take the court at the SM Mall of Asia Arena for a preseason match. This was announced earlier at a press event held at the aforementioned venue. In attendance was Scott Levy, the SVP and managing director of NBA Asia, along with top executives handling the arena and its parent company such as Hans Sy. Levy even presented Sy with an autographed Danny Granger jersey and the official NBA game ball that’s intended to be used on the game itself. The press event opened with a cheerdance number care of SM-owned National University’s pep squad. Host Chiqui Reyes then introduced some of the guests. Video messages from NBA Commissioner David Stern and Rockets head coach Kevin McHale were played on the jumbotron. Levy stated that the aim was to get the game on as wide a range of media as possible, so making the game broadcast available on free TV could be a possibility. There are no details so far about ticket pricing or when SM will start selling tickets. Arena officials say that these details are still being figured out at the moment. We’ll keep you posted when the information becomes available, so do check back frequently. You can also follow us on Twitter over at @OLFblog. Filipino hoops fans were treated to all-star exhibition matches featuring a team that had Kevin Durant, Kobe Bryant, and Derrick Rose, among others, going up against a PBA all-star team and the Smart-Gilas national team during back-to-back games in 2011, while the NBA still had a lockout. James Harden was also part of that event, and now he returns as the leader of a Houston Rockets team currently competing for a playoff berth. It’s tough to predict ticket prices for the NBA preseason game if you’ll be basing them on the Smart Ultimate All-Star Weekend ticket prices. For one, that was not an NBA-sanctioned event. Second, Manny Pangilinan and his very deep pockets made it possible to bring those stars here, which is probably why the tickets were fairly affordable considering the lineup brought to play at the Araneta Coliseum. Still, we hope the prices would be affordable enough to make the game accessible for NBA fans in the Philippines. The last time an actual NBA team was brought over to play a game in the Philippines was in 1979, when the Washington Bullets, led by Wes Unseld and Elgin Baylor, played some exhibition matches against a team made up of PBA stars.